You will feel much more confident and have more pleasant training sessions. EASE OF USE ENABLES WORKING WEIGHT TO BE CHANGED QUICKLY. You no longer need to waste lots of time annoying yourself with unwieldy spring collars when changing the working weight. Training sessions will become much more pleasant. SAFETY IS PARAMOUNT WHEN WORKING WITH WEIGHTS! Iron Lab collars were developed to withstand serious strains. The cam clamp locks securely onto the bar. You will feel much more confident and have more pleasant training sessions. MATERIAL: HIGH-STRENGTH NYLON. 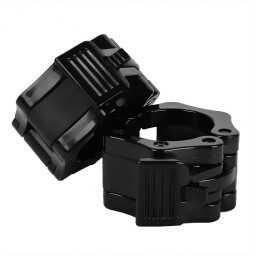 Iron lab collars are manufactured from high-strength nylon using casting and high-pressure processing. The simple clamp locks securely into place. The durable cast body and high-pressure grip pads make the collar virtually indestructible!